When you look at the Fujitsu MHT2060AH you are looking at a wonder of technology. This Fujitsu hard drive employs the Glass Direct Texture Media that lets you store a lot more information in the same space. With a large 60 GB capacity the Fujitsu MHT2060AH has enough space to store your essential data. 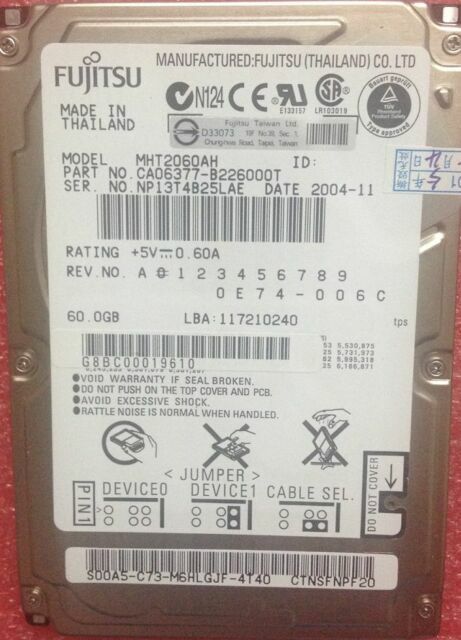 This 60 GB hard drive provides improved data integrity that keeps all your data safe. Built with the innovative Fluid Dynamic Bearing motor, this Fujitsu hard drive gives you fast access to your data. This 60 GB hard drive is engineered with the Inertia Latch technology that moves the head and reads data swiftly thereby reducing seek time.